Put piggy banks and paper money behind you! iAllowance is the only thing you need to manage your child’s finances and teach him or her about saving and spending money. Whether you want to set up a weekly allowance or pay out a special reward, iAllowance handles everything for you with an eye-pleasing and easy-to-use interface. 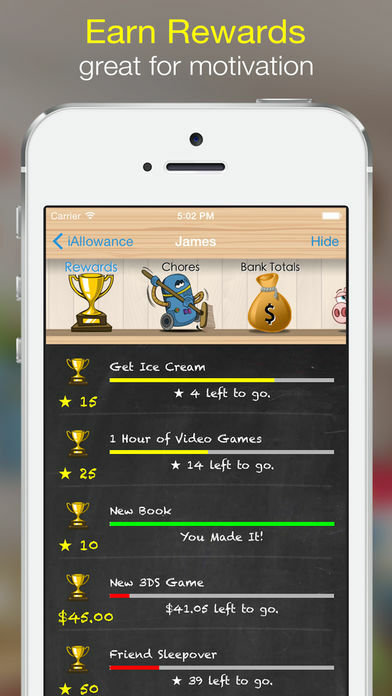 iAllowance may look simple at first glance – the bookshelves and chalkboard make this app very approachable. However, iAllowance is a powerful family finance management system, allowing you to set up scheduled payouts, deduct expenditures, and show category totals – even search for a specific transaction! Kids are very busy these days. From general spending money to clothing allowances, gas money to cell phones accounts, kids and parents have a lot to keep track of in today’s world. 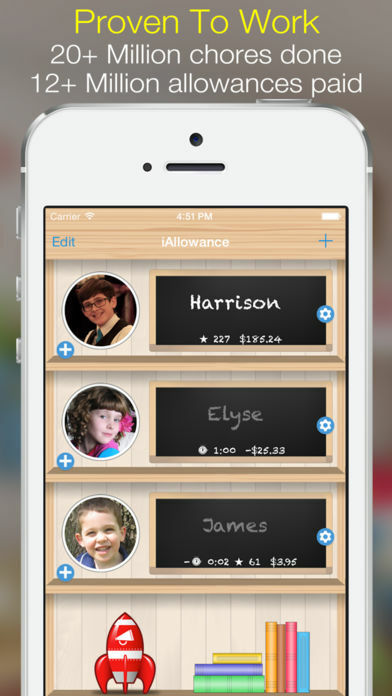 With iAllowance, you can create an unlimited number of banks for each of your kids. Each bank has its own transaction list where you can add, edit and delete transactions as often as you need to. 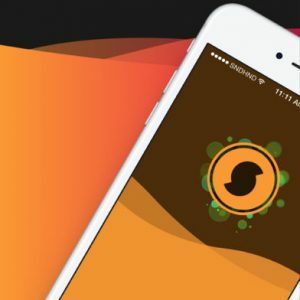 If you don’t want to use real money, you can setup any bank to use stars or even time. Mix and match star, time and real money banks to make iAllowance work best for you. Furthermore, you can assign an optional interest rate to any of the banks to help teach your children the value of saving money over the long term. 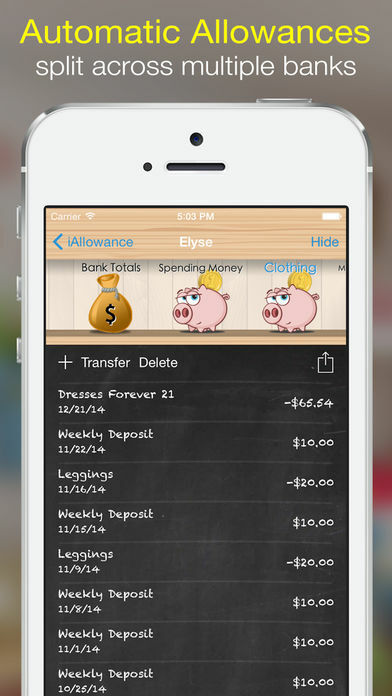 Let iAllowance do the remembering for you! 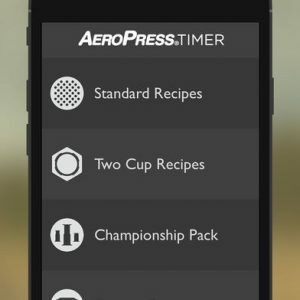 It’s easy to set up any number of allowances that will pay out automatically at repeating intervals. Each allowance can be set up to pay into one or more of the child’s banks. There is no need to setup a single allowance for each bank. 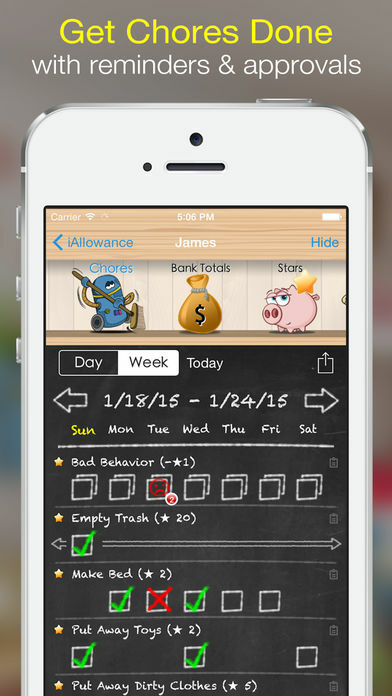 Track all your children’s chores with iAllowance. Get your kids involved in the process and watch the chores get done! 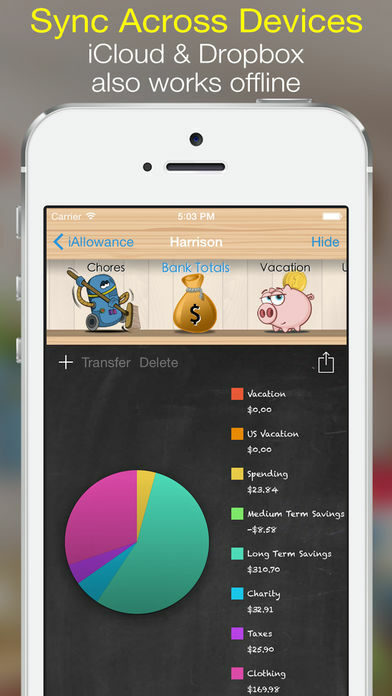 Use the reminders to push alerts to your kids – even if iAllowance is not running. Kids are more motivated when they have goals to work towards. You can setup rewards that you can choose to ‘cash in’ when you child reaches the set goal. We feel that it’s important to get your kids involved in managing their own finances, but it is also important that you have a choice as to whether or not they can edit the information. By turning on the built-in parental controls, you can restrict your kids to a view only mode while you maintain full editorial control for yourself. Use your Dropbox.com account or iCloud to sync iAllowance with all of your iOS devices. iAllowance will automatically store local backups of your data so you can always get back to where you need to. We are certain that iAllowance will meet all your family finance needs. So, make the leap with Jump Gap Software’s iAllowance.